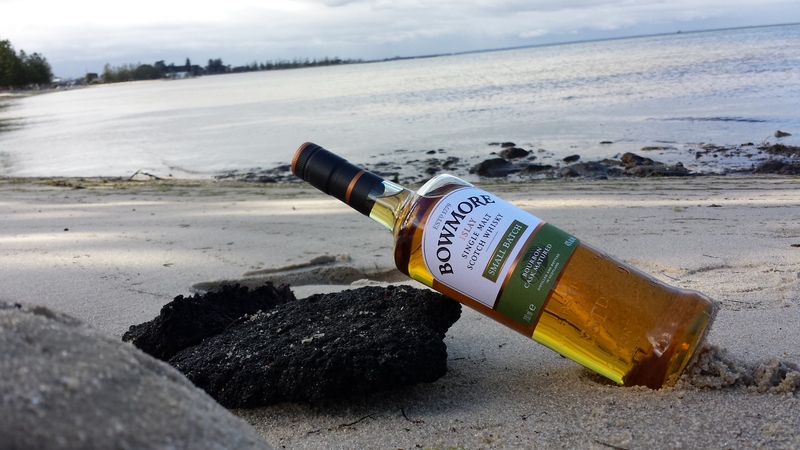 Bowmore has sat on the shore of the Loch Indaal on the Isle of Islay since 1779, and it is at this idyllic spot on the “Jewell of the Hebrides” that Bowmore has been plying its trade for about 235 years. One of its newest expressions is the Bowmore Small Batch, a No Age Statement whisky that is matured in first and second fill ex-bourbon casks. The idea, at least on paper, is to draw out vanillas, spices and some bourbon inspired flavours from the first fill cask (which has held whisky for the very first time, so its has lots of flavour to give the whisky) and combine with some softer flavours from the second fill cask (because this cask has been used already and therefore has less flavour to give the whisky the second time it is filled). Bowmore bring together whisky matured in both first and second fill ex-bourbon casks and marry them together to create the Bowmore Small Batch. The bouquet is fresh, light and crisp with notes of citrus accompanying soft waves of peat, an ocean breeze, caramel, pot pouri, scented candle, honey, Ferrero rocher, sour gummy bears, sour green apple, and very mild hints of vanilla with plenty of honey. On the palate the whisky is soft and slightly oily with an enjoyable mouth-feel, offering notes of vanilla, raisin, peat, damp wood with wood spice, lime and sea salt, with a more fresh vegetal cut grass melding with the peat from mid-palate and into the finish. On the finish the peat and sea salt fade, though not entirely, remaining beneath fresh watery vegetal notes and hints of vanilla, bourbon, lime in cola and honey. Overall, Bowmore Small Batch is a very enjoyable single malt whisky that, despite erring on the young side, is a refreshing and relatively complex dram. It is a great value whisky that is clean, fresh, smooth, relatively light and easy drinking, and particularly drinkable on ice. At its price, I have no complaints though I still prefer the Bowmore Enigma 12 year old and Bowmore 18 year old for their added complexity, depth, richness and age.